You'll be £8.00 closer to your next £10.00 credit when you purchase Collectable Names and Designs in Women's Shoes. What's this? Full with innovative, sculptural and outrageous footwear this book celebrates all shoes from the pump to the platform and the court shoe to the stiletto. Beginning with a look at the history of shoes the book predominantly looks at designer offerings from the 20th and 21st Centuries. 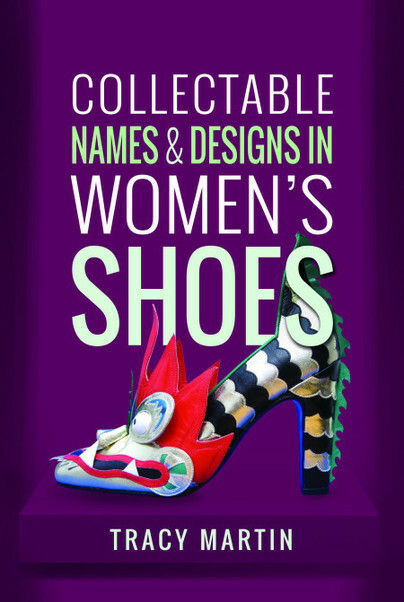 Packed full of information on the innovative shoe designers, where they gained their inspiration and how their fabulous footwear impacted on the fashion scene along with interesting facts and tips on the area of collecting shoes. Tracy Martin will prove there is literally a collectable heel to fit every foot from the more conservative to the downright outrageous which only the fashion forward would dare to wear. This is an inclusive how-to guide which doesn't try to be anything else. Martin is an excellent spokesperson for her subject, taking away any perceived snobbery. Museums with good shoe collections are also listed and collecting tips relevant to particular decades are give, including common features and condition expectations. Tracy Martin studies the great designers, such as Ferragamo and Perugia. She also writes about new designers and she gives tips for collecting several different types of shoes. This is a useful book for beginners and people who have started collecting.